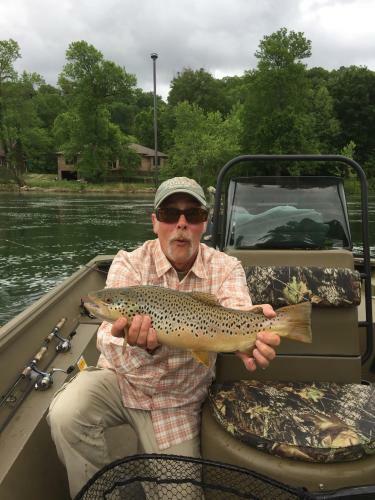 Big browns can be caught on just about anything, anywhere, any time of the year on Lake Taneycomo. The current state record caught by Scott Sandusky, weighing 28 pounds 12 ounces, was caught on power bait around Cooper Creek. The previous state record brown of 27 pounds 10 ounces caught by Rick Osborne, was caught on a scud (fly) up by Table Rock dam in the trophy area. 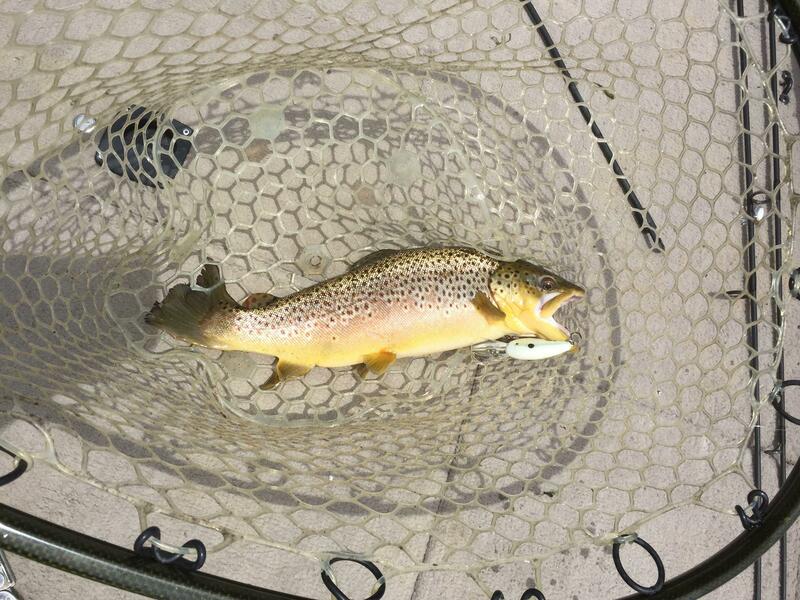 Big browns are caught on flies, jigs, night crawlers, power bait, spoons and other lures all year long. 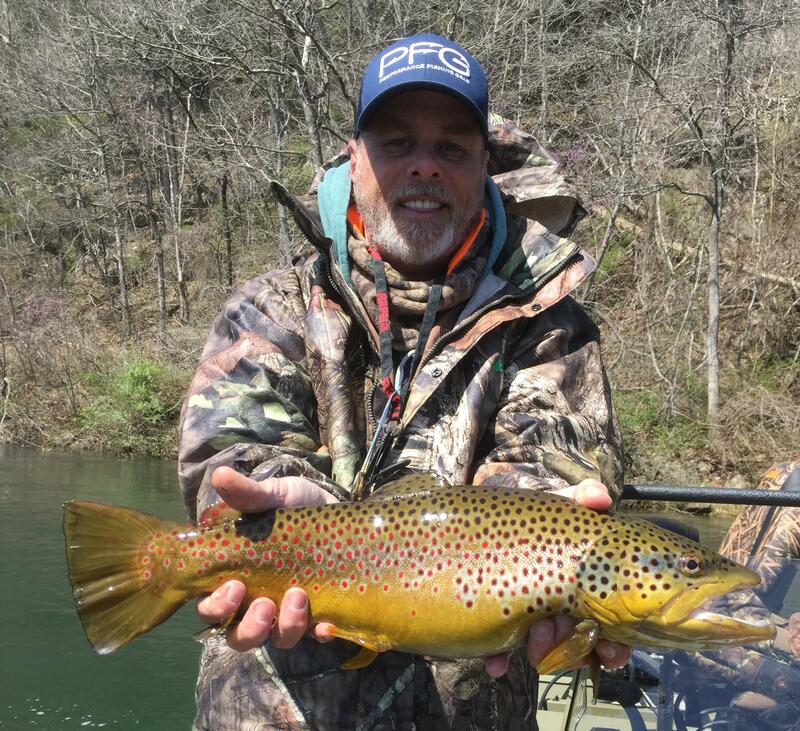 While big browns can be caught on anything, any time, you can increase your odds of catching one. Targeting bigger fish is a key way to make this happen. 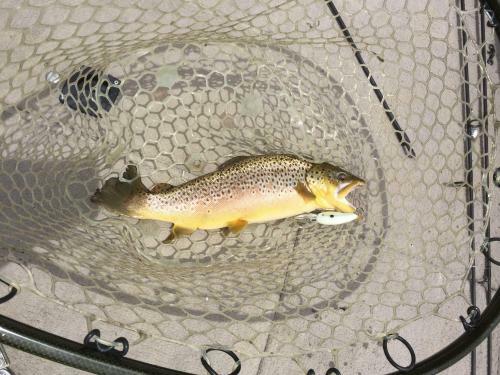 Browns, like all other fish, will take advantage of an easy meal. The bigger the meal the less energy they have to expend. Start presenting bigger meals. The bigger fish are looking for the most bang for their buck. They expend much less energy eating a good sized shad or rainbow rather than spending all day collecting midges and sow bugs to fill the hole. Start using a bait that represents something that would satisfy a big fish for a good meal. Make it big enough that a big fish would have to eat it, or a very aggressive smaller fish with a huge appetite takes it. Catching 100 fish in a day has always made for story telling tails that last for years and make great memories. I still like to play the game of trying to catch 10 fish in 10 casts. Number games are fun! I also like catching trophy browns. When I decide to chase the big boys, it is not a numbers game. I do not catch them every time I target them, but I am catching them on a more consistent basis when targeting them. The idea seems simple, but it is really hard to commit to catching a big fish. 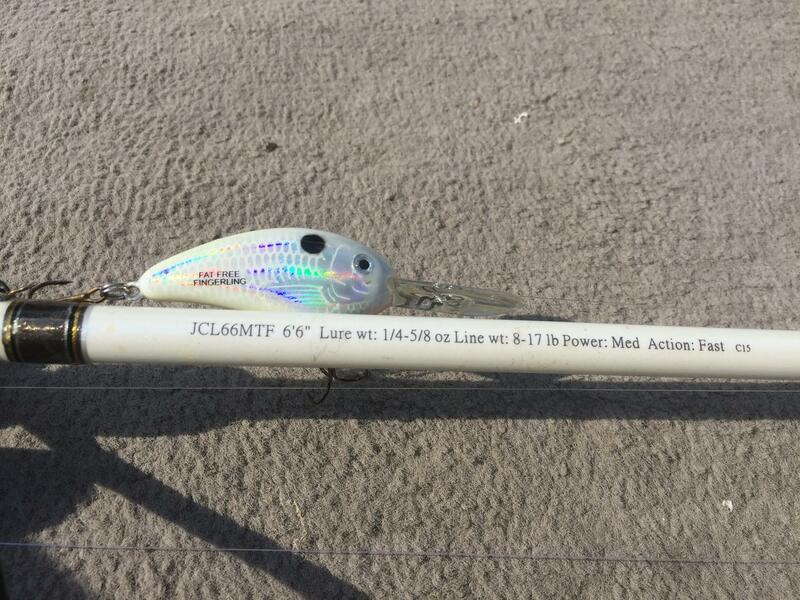 Making the commitment means using lures that do not normally catch big numbers of fish. If they do catch fish, chances are, the fish will be big, or at least, be an aggressive fish with a lot of gumption to hit a lure that big. For me, at first, it was hard to keep throwing a 5 inch jerk bait or deep diving crank with out getting bites on every other cast knowing that if i was throwing a jig, I would be seeing that kind of action. Bigger fish are keying in on shad. Proof of this is when catching bigger fish, they are spitting up shad. Bigger browns that are being brought in to be weighed are leaving regurgitated shad in the live wells. I have been noticing increased shad busting activity mostly in the early morning hours and later in the afternoon. This is not happening only when the flood gates are open, or in the trophy area. It is happening all up and down the lake. When I am targeting big browns, I will use bigger baits that are normally thought of as being used for bass and walleye. Mega Bass 90’s, 110’s, 110+1’s, Bomber Fat Free Shad in the Fingerling and Fry sizes, and Berkley Flickershad in 7cm and 5cm are the main baits I like to use and each one is for different water conditions, time of year, and flows. I loose a lot of gear! On a four hour trip, I average loosing 4-5 lures, but I am catching a lot of big browns. I guess I have to look at it as, “What is a trophy class brown worth?” Five baits at about $7 each equals $35. Is that worth it to me? The answer is yes! Flickershad are relatively cheap and catch big fish. Do you have to throw $25 Mega Bass? No. I just like throwing them under certain conditions. Bomber Fat Free Shad are about middle of the range and probably my favorite. I started to make the change to targeting pigs two years ago during a high water event. The flood gates of Table Rock dam were open along with 4 units of generation with about 24,000 cubic feet per second of water flowing. Tons of shad were coming over the dam and jig fishing was incredible catching good sized rainbows and some browns. The problem was, the only way to get to the bottom was to be using two 1/8 ounce jigs. I decided one day to throw a Mega Bass that I normally used for walleye on Upper Bull Shoals in the winter. First cast I caught a 20 inch brown. I lost the lure on the second cast, so I knew it was getting to the bottom, but loosing $25 hurt. I had a Bomber Fat Free Fingerling in Bill Dance pearl white that I decided to try. While drifting in 24,000 c.f.s., I cast the lure back up towards the dam. I started reeling it down, and to my surprise, after about 8 cranks on the reel, it hit bottom. I stopped reeling to let it get off the bottom, and again, to my surprise, it just kept digging the bottom. Twenty seconds later, the rod was almost jerked out of my hands. 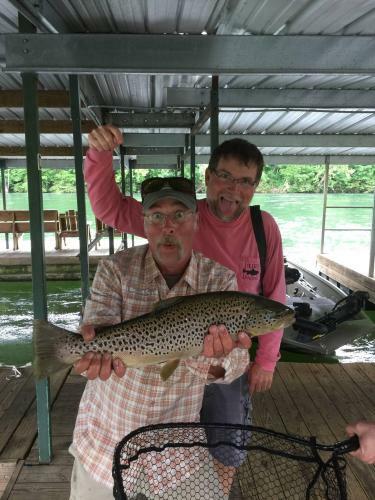 After a good fight, I landed a 22 inch brown. I continued fishing that way and after 4 hours, I had landed 6 fish over 20 inches. I found after time that I could keep the Fat Free Fingerling down from the dam to Short Creek with 3 or more units of water flowing. That's almost 5 miles of water under the right conditions you can just drag a potentially big fish catching crank bait. During the summer months of July and August, the Corp began a pattern of running 4 units of water in the late afternoon. I took the Mega Bass 110+1 up to the trophy area and gave it a try. First time beating the banks in high generation produced 4 fish over 20 inches in two hours of fishing. That became a habit every afternoon. I think I had one or two trips that summer during flows like that where I did not boat one over 20 inches. I did loose 10 of those Mega Bass lures in those two months. That method of jerk bait fishing for big browns was productive from the dam down to Fall Creek. During lower water conditions, I still had been noticing big browns being brought in from all over the lake spitting up shad. Another phenomena that was happening was seeing big browns all up and down the lake busting shad on the surface. This is not just happening in the trophy area but I have seen it as far down as the Branson Landing area. Throwing the Mega Bass 90 has been a good way to target the shad busting browns during the heat of the moment. I have also started playing with the Bomber Fat Free Shad in the Fry size with lower water flows. I can get that bait on the bottom with 2-3 units of water flowing and keep it down by just dragging, from the cable to Fall creek. I have also begun trolling that bait along with the Flickershad from Fall Creek to Branson Landing and catching trophy class browns. In one 4 hour period, that method has produced 3 big browns to the boat. 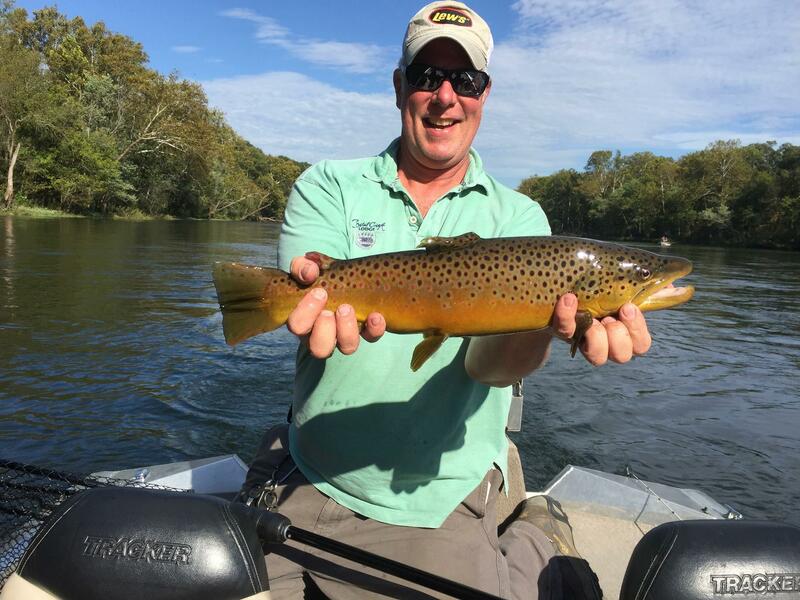 Since making the decision to make a commitment to fish for big browns, I have increased my catch rate on the trophy class fish. I no longer go out fishing with hopes of catching a big brown every now and then. I now know its just a matter of time before I catch another. The change in technique, lures used, and the commitment to sticking with it has put several trophy class browns to hand and seems to only be getting better. Give it a try. 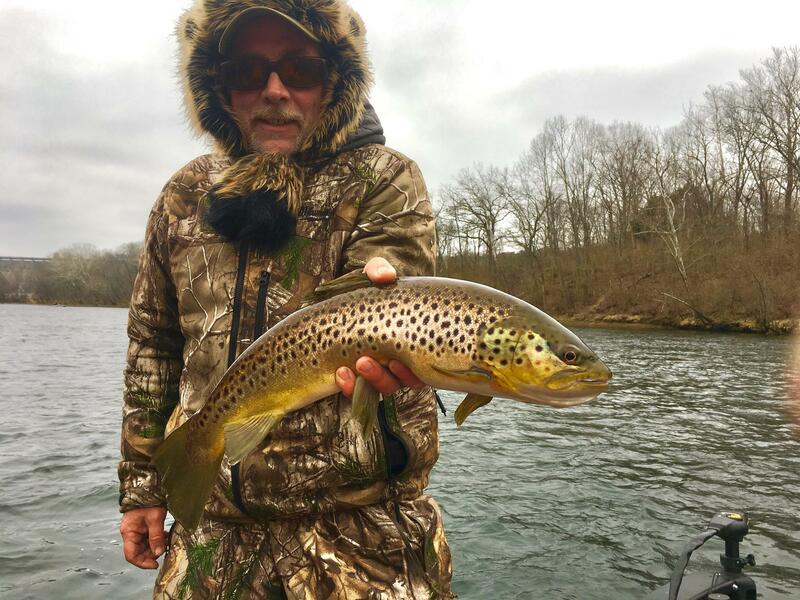 on your next trip down to Lake Taneycomo, commit 2-4 hours hunting for that trophy class fish. You might be pleasantly surprised!